A new report from the Nature Conservancy and Anderson Economic Group LLC indicates that aquatic invasive species cost Michigan and other states in the Great Lakes region significantly more than $100 million per year. Industrial, utility and municipal organizations that draw water from the lakes for operations bear a majority of the cost, as well as the tourism and fishery industries. Also included in the $100 million estimate are lost revenue, the costs to nonprofit organizations working in related areas, and homeowners spending money on private abatement. This issue is receiving greater attention as the number of invasive species (currently estimated at 186) continues to grow and companies’ lost revenue is becoming more documented. The health of the Great Lakes impacts the quality of life in Michigan, which in turn attracts new business and jobs to the state. MNA is dedicated to protecting Michigan’s natural heritage and hopes that conservation organizations, lawmakers and businesses will continue to work together to preserve the integrity of the Great Lakes. For more information about the economic impact of invasive species, visit the Nature Conservancy’s website. This article in Crain’s Detroit Business also provides excellent information. 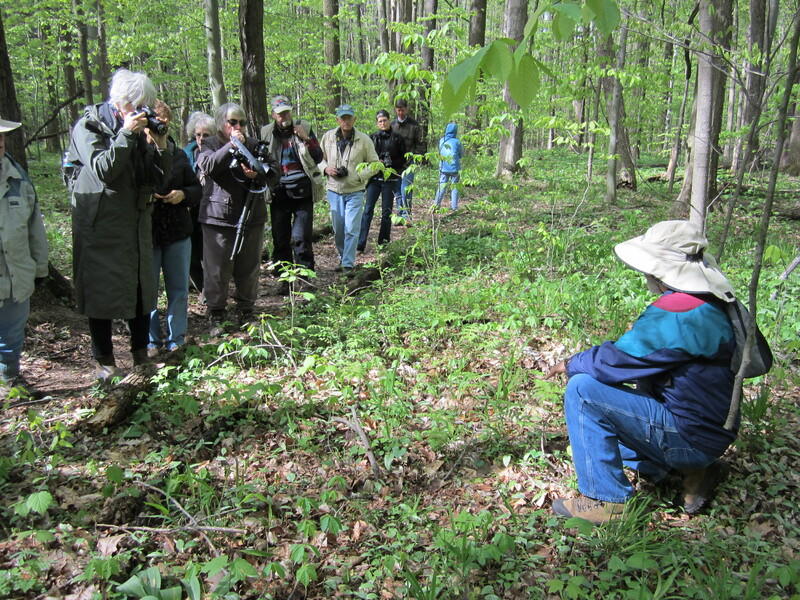 Thirteen of us joined local birders Joseph Youngman and Lynn Murphy for an early morning trek in the James Dorion Rooks Memorial Nature Sanctuary on May 20. Hannah, the daughter of Jim Rooks, related how her father so loved and appreciated this area. The youngest to join the group was little Fiona, at only two years old! No one would admit to being the oldest. We were soon rewarded with the sighting of an Indigo Bunting in brilliant plumage. The trail winds through the forest and along Garden Brook are an excellent habitat for both migrating and nesting birds. By the end of the hike, Lynn had recorded twenty-three species heard and/or observed. Her list included familiar birds including the White-throated Sparrow and the Black-throated Green Warbler and some less familiar, including the Canada Warbler and Swainson’s Thrush. Some of the group drove up to Klipfel Memorial NS to observe the raptor migration. Unfortunately, the black flies were thick and breakfast became a better option. Check out the MNA Events Calendar for upcoming hikes and field trips. We hope you’ll join us at an event near you! Thirteen people, including some new faces, joined us as we met up with sanctuary steward, Jim Slaghuis. 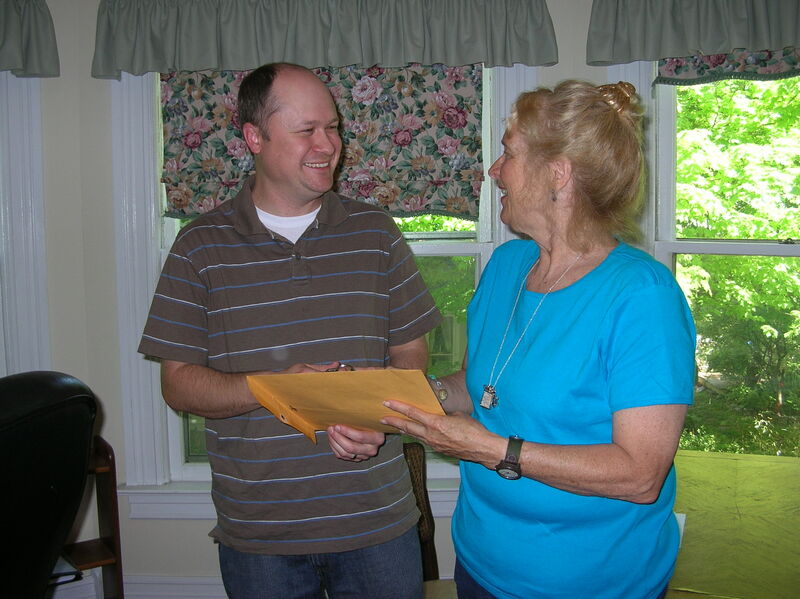 Jim has had a part in Wade for most of his life, knowing both the history of the property as well as the many terrestrial and aquatic plants, birds, reptiles, and mammals who call Wade home. A unique feature of this sanctuary is that a small one room cabin is located not far from the entrance. Built about 50 years ago, it has been used by scouts and other groups throughout the years. In the cabin is a guest book that people sign and leave notes on their experience at the sanctuary. We made sure to leave a note about our Odyssey visit. Jim is planning to put a new roof on it this summer, as he continues to protect and improve this 72-acre property. A treat for the Odyssey hikers was a walk down a 30-foot bank to the shore of Silver Lake which we had seen from the ridge above. In the Sanctuary Guidebook, this sanctuary is described as a beech maple forest. Indeed, there are numerous beech and maple trees here, but there are also many, many red oak and, of course, the northern hemlock that are found mainly along the ridge going down to the wetlands and Silver Lake. This would make these woods more of a mixed northern hardwood forest. Much of the understory shrubs and wildflowers that we found here would help to confirm this. There were not many of the typical beech-maple spring ephemerals, but we did find a lot of blunt-lobed hepatica and true Solomon-seal. We also found wild sarsaparilla, flowering dogwoods (just past their prime) and a profusion of maple-leaved viburnum and witch hazel. The viburnum was in bud, and the witch hazel does not fully bloom until fall. This makes me want to come back later in May to see all the viburnum in bloom and in October to see the witch-hazel. This sanctuary is open to the public, so you can also come and see this! Another thing that we noticed was that many of the large trees here have multiple trunks, especially the red oak and some of the beech and cherry trees. This fits with the history of the woods being burned about 90 to 100 years ago with some of the trees resprouting with multiple trunks following the damage from the fire. 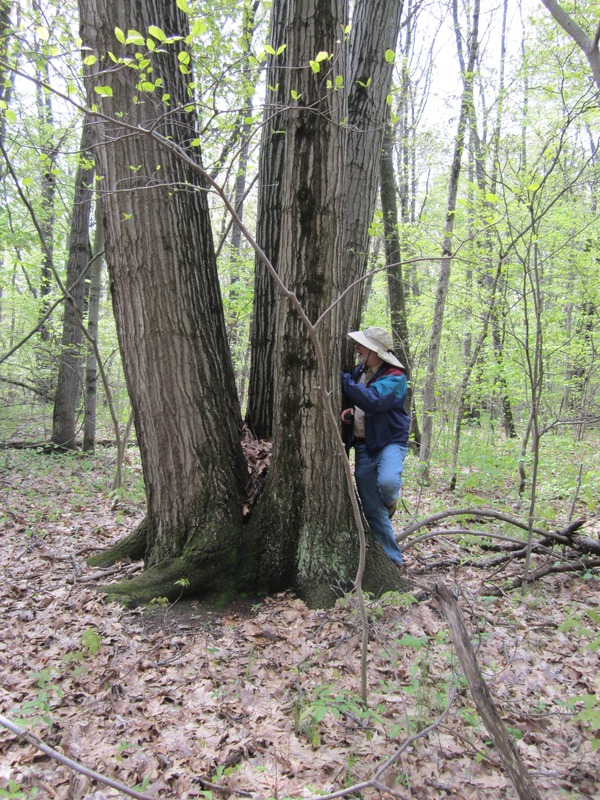 We saw one red oak with five large trunks! To see more photos from our visit to Wade Memorial, visit MNA’s Flickr page. As we continue on our Odyssey we will occasionally offer additional opportunities. During the next segment we have another added bonus hike. After our morning hike at Mystery Valley Karst Preserve and Nature Sanctuary on June 5, we encourage you to bring a brown bag lunch, after which we’ll head to the Peter Memorial Nature Sanctuary to look for the dwarf lake iris, the official flower of the MNA. The iris should be in full bloom at this time. The rest of the next segment includes a visit to Kernan Memorial Nature Sanctuary on June 6 right on Lake Huron and Brennan Memorial Nature Sanctuary in St. Clair County on June 7. All three tours start at 10 am, and there will be 60th anniversary refreshments at the end of each tour. As we pointed out before, we keep adding more to our Odyssey! On July 14, there will be a kayak tour of the Les Cheneaux Islands. We invite MNA members and friends to meet up for the kayak Ecotour offered by Woods and Water, at just $75 a person. For more details, see the MNA website or call the office. This will be the day before the hike at Fred Dye Nature Sanctuary. Plan a wonderful weekend with Dave and Tina on both the land and on Lake Huron. If you would like MNA to coordinate a bus tour to the last two of our Odyssey hikes in the Keweenaw please contact the office, as planning needs to begin. Call (866)223-2331 and ask to speak to Laurie or Johanna. For more Odyssey dates, visit the MNA website. We hope to see you there! Charlie Goodrich shows off one of his wife Nancy’s delicious Michigan cookies – complete with a sanctuary locator star! Can one person truly make a difference in the world? If your name is Charlie Goodrich, you already have and continue to do so. 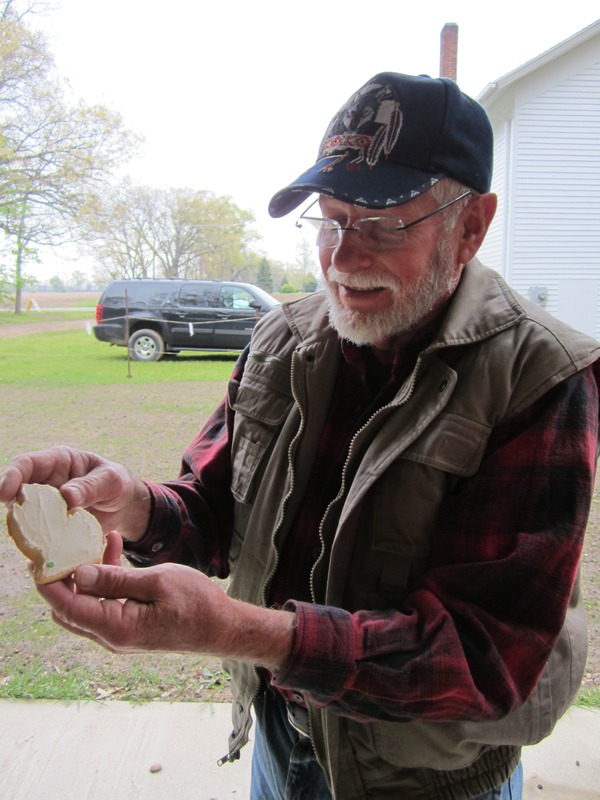 Charlie has dedicated his life to the Hamilton Township Coastal Plain Marsh in a huge way. If you are walking on a trail there, Charlie carved it out. On a boardwalk? Charlie built it. Sitting on a bench and relaxing? Charlie put that there, too. Sometimes family and friends help Charlie in his work, but the hand of Mr. Goodrich is everywhere. His dedication and enthusiasm is boundless, and when he is not working in “his” sanctuary he is working at another MNA sanctuary or helping to restore the Historic Hamilton Grange Hall which adjoins the Hamilton Coastal Plain Marsh. Oh, one more thing about Charlie – his wife Nancy made the most delicious cookies in the shape of our “mitten” with a little candy dot to show where the sanctuary is! What a yummy confection our 12 hikers had at the end of the trail. This sanctuary consists of a 79-acre recovering woodland that surrounds a coastal plain marsh. Charlie led the hike and also gave a bit of history as to how the plants, called coastal plain disjuncts, in the marsh came to be there. Only found on the eastern seaboard, and in southwest Michigan and northern Indiana, it is believed the plants were transported here 11,000 years ago as the last of the Wisconsin glacier receded, creating a drainage channel down the Hudson River connecting Michigan with the Atlantic coastal plain. Among the rare plants that grow here are meadow beauty, tall beak-rush, bald-rush, and seedbox. 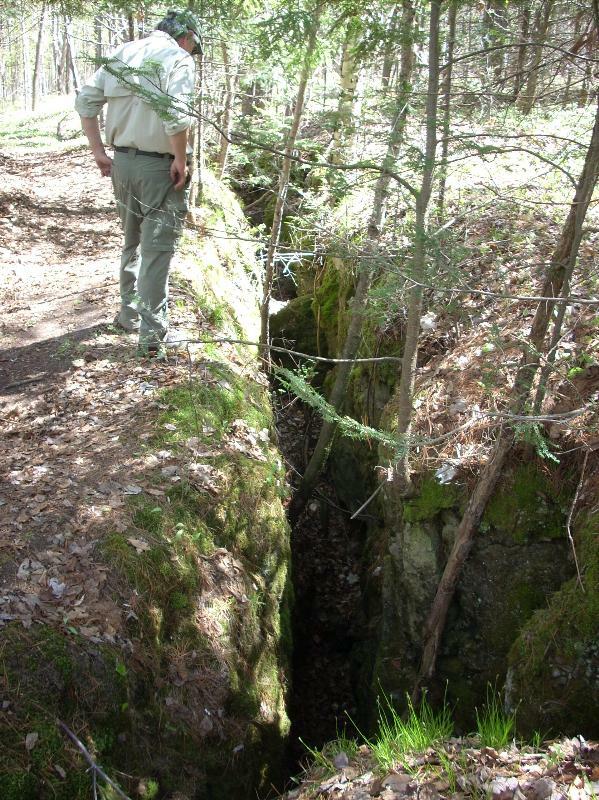 MNA’s June 5 Odyssey Tour will visit Mystery Valley Karst Preserve and Nature Sanctuary in Presque Isle County. 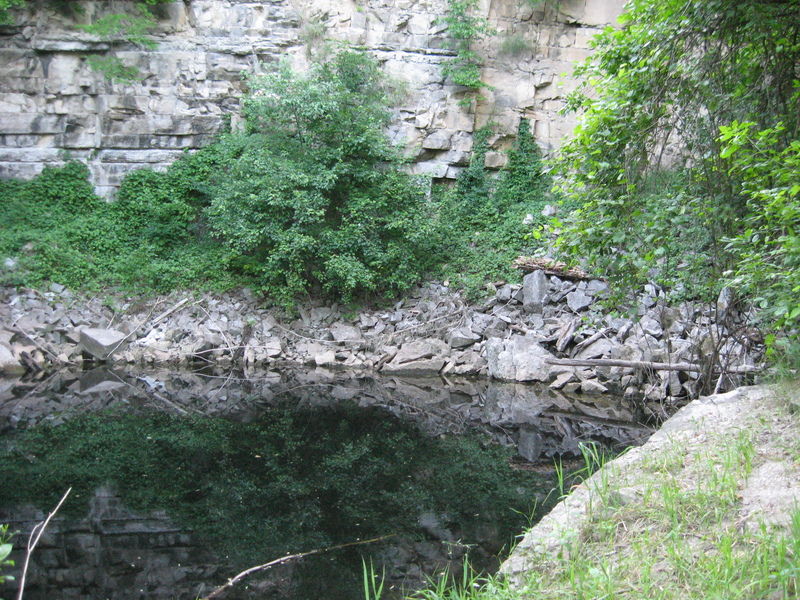 Mystery Valley is home to one of the largest karst collapse valleys in the Great Lakes region. Karsts are extremely fascinating. They are an area of irregular limestone in which erosion has produced cracks, sinkholes, underground streams and caverns. Limestone forms from the shells of mollusks and coral reefs accumulating in seas over vast periods of time and being compacted into rock. In Michigan this deposition occurred in the early Palezoic era, roughly 500 million to 350 million years ago. Lands that karsts occur on are generally lacking surface streams, so water drains mainly or exclusively underground. The Mystery Valley karst was formed by the collapse of the surface into a network of underground chambers created by erosion of the rock below. Several dramatic earth cracks have formed along with a lake that rises and falls, and sometimes disappears altogether! Mystery Valley is 1.5 miles long, 500 yards at its widest point and about 150 feet deep. 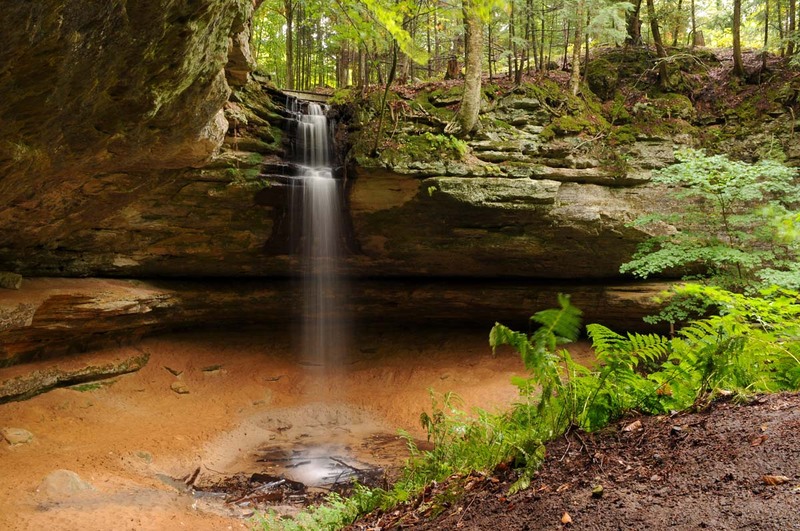 Here visitors can explore this unique geologic wonder by following the 1-mile Earthcrack Trail. Hikers can view large cracks caused by the moving rock. These cracks can span more than 100 feet deep in some places. Together, the Michigan Karst Conversancy (MKC) and MNA work to protect this natural wonder and its surrounding area. To learn more about karst geology, check out Living With Karst: A Fragile Foundation. Join Dave Wendling and Tina Patterson on June 5 at 10 a.m. to explore this extraordinary karst, and don’t forget your camera! To RSVP for the Odyssey (and for driving directions), visit the MNA website. If you can’t make it to the Odyssey Tour, MNA’s Fall Adventure will also tour Mystery Valley, along with several other sanctuaries in the northern Lower Peninsula. Learn more on MNA’s website.